We love pocket cookies. They’re our favorite thing. 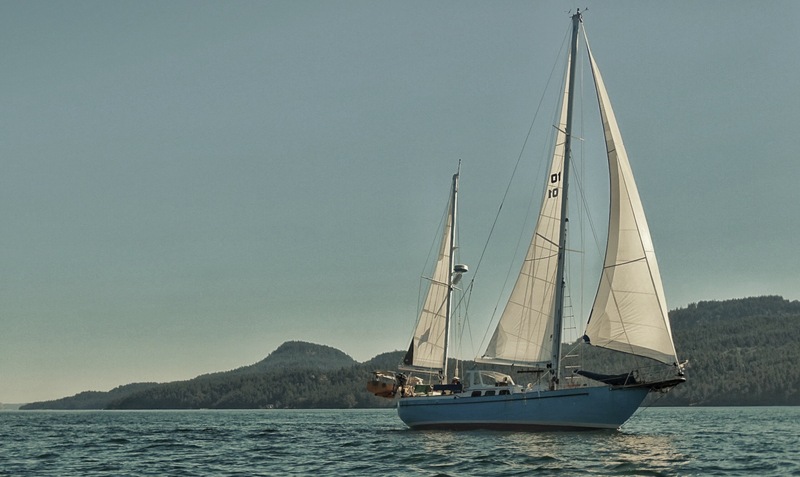 After a night in Roche Harbor we weighed anchor and set our sights on Reid Harbor on Stuart Island. The passage is only 4 nautical miles so we did not feel pressured to wake up early. In fact we all slept in and had a nice leisurely morning. We even started dinner and let it cook in the Wonder Bag while we motored to our next anchorage. It was an overcast and rainy day. Not exactly the summer weather we had hoped for. It certainly made us wish that the windows had been installed on the dodger. We did catch another glimpse of the orca plane though! Still no live orca sightings. Sigh. One of the glorious components of cruising is figuring out where to empty the holding tanks. Not every harbor has a pump out station so there is a bit of planning involved. How full are the tanks? How long do we plan on staying somewhere? On average, how many times are we pooping each day? 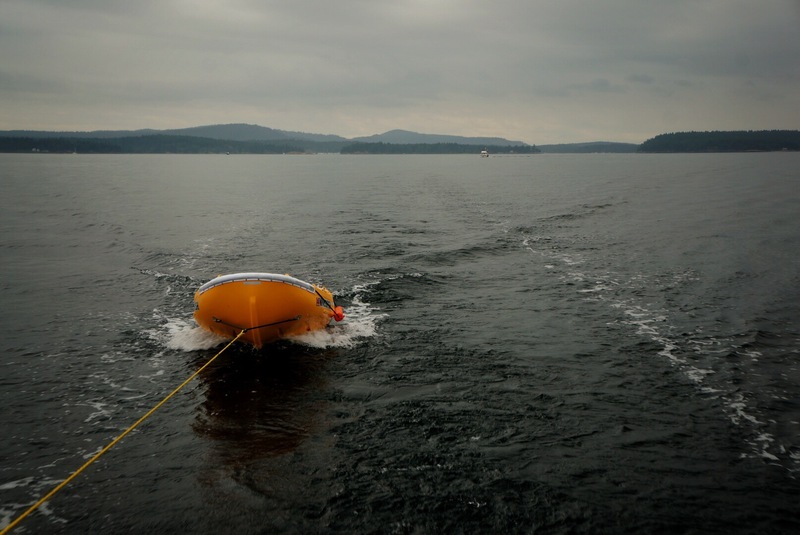 We thought we should play it safe and pump out while we had the chance in Roche Harbor. Luckily, Jeff informed us that the pump out station in Reid Harbor is much easier to access than the one in Roche Harbor. Unfortunately, there are no instructions and it took the team a while to communicate effectively and figure out that it’s a manual pump with a giant lever rather than the lever acting as an on/off switch. Since the island does not have electricity, you’d think we would’ve figured it out sooner. 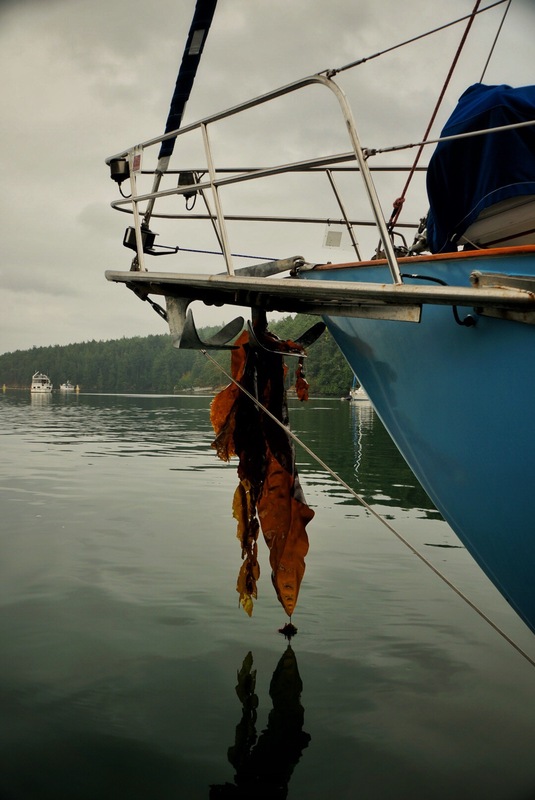 We did notice that we had carried a giant piece of kelp on the anchor all the way to Reid Harbor though… so that’s good. Stuart Island has some really interesting history that I won’t dive into, but it was the fighting ground for the last battle between the Brits and the Yanks during the feud to determine which islands belonged to each country. Spoiler alert: the only casualty was a pig. History buffs should look it up. Nowadays, there are about 15-20 full time residents on the island. With no electricity and no ferry service, the residents rely on solar, wind, propane, generators, and wells. The one room school house is currently closed since there are no school-aged children currently living on the island. We rafted up with the Jeff, Brenda, John, and Jeannie. The boys had been busy fishing and contribute fresh salmon for dinner. Jeff and Brenda also provided dessert: pocket butter cookies. You know when you’re making cookies and you’re supposed to have butter that isn’t too cold and isn’t completely melted? Leaving it out on the counter takes way too long, and microwaving it makes it too melty. Jeff finally figured out the solution! Put the butter in your pocket! Based on the cookies, I think he is really onto something here. Please try this at home and report back. Stay tuned for more adventures from Reid Harbor! no electricity, no ferry service = a place to “get away from it all.” i am surprised it is not overcrowded with visitors!